Shares of Blue Apron (NYSE:APRN) took a hit last month as investors continued to lose faith in the struggling meal-kit service amid the broader market sell-off. The stock fell below $1 for the first time, sparking concerns that the stock could become delisted. In fact, shares had lost nearly 50% at one point, but the stock recovered most of those losses to close the month down just 13%, according to data from S&P Global Market Intelligence. A deal with Weight Watchers, now known as WW, helped drive the rebound in the stock toward the end of the month as the chart below shows. The first half of December was relatively quiet for Blue Apron, but trouble started for the stock on Dec. 18 when shares fell below $1 for the first time, sparking a 10% sell-off as investors worried that the stock could become delisted from the New York Stock Exchange if it remained below $1 for more than 30 days. The following day the stock plunged again after the Federal Reserve raised interest rates, rocking the market. As an unprofitable company currently relying on debt, rising interest rates will make future borrowing more expensive for Blue Apron, and they also threaten to slow down overall economic growth, a problem for Blue Apron since it depends on consumers with discretionary income. The stock fell further over the rest of the week, but then bounced back on a partnership with WW to sell co-branded healthy meal kits, which gave investors a reason to be optimistic. Blue Apron has moved above the $1 mark at the end of the month, temporarily allaying concerns about the stock being delisted, but the company's problems are far from over. Customers have been fleeing the business for more than a year, and though its losses are narrowing, it will be difficult to build a viable business as long as revenue is plunging. 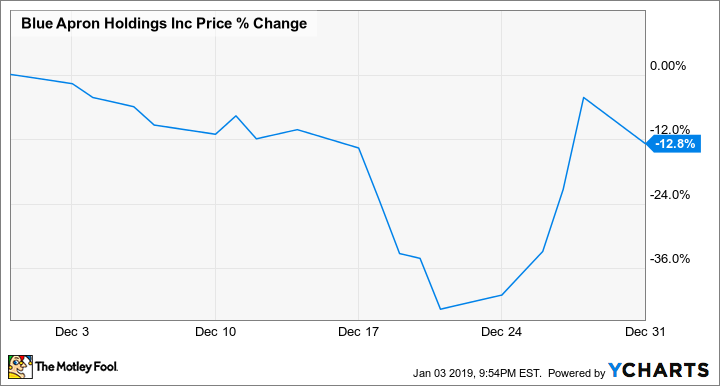 Management is targeting positive adjusted EBITDA for 2019, which would be a big step in the right direction for the company, but investors are clearly losing patience. If the market continues to sour this year, Blue Apron stock is likely to fall with it.